I did something last week that I’ve been resisting for a long time – I set up my Spring semester Scrum board with all of the “big things” I’m working on right now – teaching and and championing my Design thinking Studio pilot, serving a major student life work group, shepherding a PWR major proposal through curriculum approvals (something we’ve been fighting to do for 10 years), leading some college innovation activities, and my writing-in-progress (including this blog and other Agile Faculty related projects). I have never put anything but research and writing projects on my Scrum board. Why have I never set up a board for all aspects of my faculty life? Because, look at it; it’s scary. And after I took this picture, I realized there aren’t rows for two book projects I’m working on. I regularly write up lists of everything I’m doing in terms of teaching, service, and research because I like (or need to) see where my time is going in the hopes that I can prioritize and know what I can drop if necessary, either to make room for something else or for breathing room. But I’ve never moved this to a board because I didn’t really want to see it; sticky notes would make it real and messy and overwhelming. A full board never made sense to me for teaching or service either. For regular classes, the board seems like overkill; I’d just keep moving the same sticky notes for “plan Tuesday’s lesson” and “grade five papers” from WIP to Done to WIP. And my service activities were less formal and more sporadic, heavy sometimes and nonexistent at others. Weekly to-do lists made more sense for both of these. But after a discussion with my husband about my priorities, I had to agree that I needed to see the big stuff in one place for a while, especially as I’m trying to make space for running this blog and growing Agile Faculty. One backlog per product, right? Product isn’t the right work for a human here, but my work life is one big holistic project with many features. So my life project should have one backlog. I have set up my full Scrum board in my work office, which I’m admittedly in far less in the Spring since I’m in the Studio most of the time, but it’s there, and I can update it a couple times a week. I’ve included work on everything related to my Studio program from teaching to administration to funding, the two articles I worked on during the January #AFSprint challenge have still need some attention, the student life work group since were writing some reports, the major proposal, and work on Agile Faculty. This board doesn’t contain everything that would be written on a full list of what I’m connected to (which I did this morning in my trusty Erin Condren notebook), but it includes the major things competing for my time and attention this month. I have two conference presentations and a keynote coming up in March (which, again, aren’t even on this version of the board yet. Sigh. ), so the board priorities will shift as those get closer. All of the other things that haven’t made the board because they are too small (like committees that only meet twice a semester) or not fully on the radar yet (articles and proposals I want to write but haven’t started) are safely written in a Google Doc, waiting for their time to come – like the articles that will soon be coming in for a special issue I’m co-editing and the proposal for an edited collection I’m waiting to hear from the publisher about. Their time will come. How do I feel about looking at this more holistic board? Less scared that I thought I would, but still intimidated. In some ways, it gives some of the projects more heft, a reminder that these teaching and service responsibilities are important too. It’s also helpful because things are always moving on the board. I fully admit to often losing the plot on my writing activities during a semester. When that happens, a mysterious black hole occurs over my board, and I magically cannot even see it anymore. That won’t be the case now. I’ll be interacting with the board more regularly, which will force me to see my priorities and figure out ways to actually respect my time, commit to what I care about, and focus on what’s important as i strive to maintain my own faculty vitality. 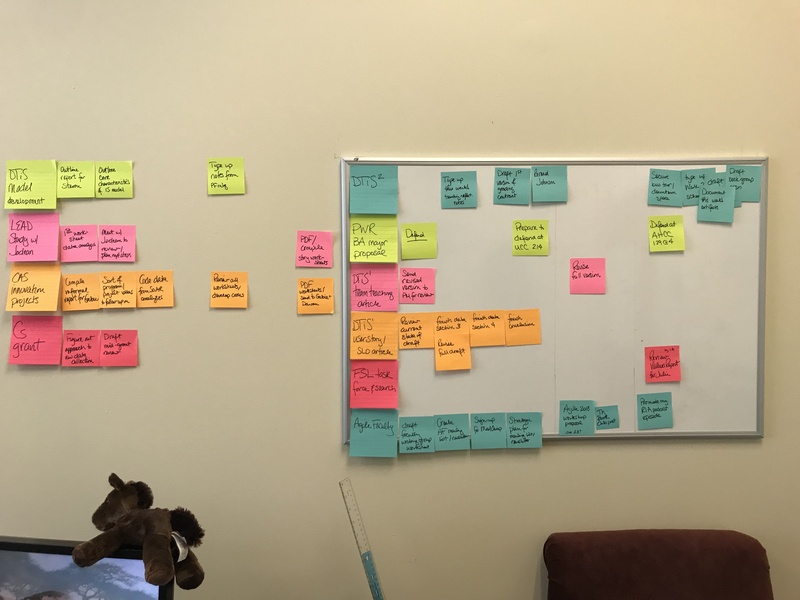 I’m going to see how this (giant) Scrum board experiment goes, and I’ll report back every once in a while on my progress. How are you using your Scrum board?